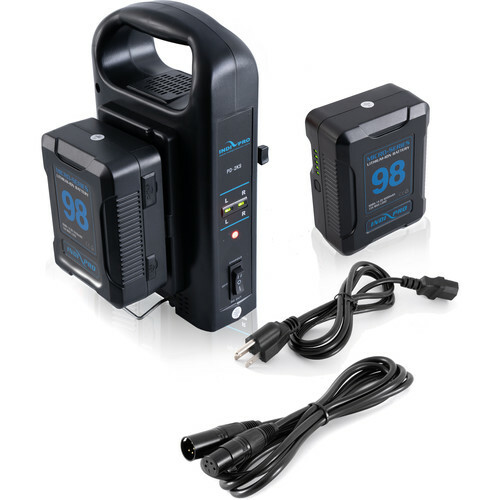 This IndiPRO 2 x Micro-Series 98Wh Li-Ion V-Mount Batteries with Dual V-Mount Battery Charger Kit includes two IndiPRO Tools Micro-Series 98Wh V-Mount Li-Ion Batteries and a V-Mount Dual Battery Charger with XLR Output. The battery features a 6.6Ah capacity and 14.8V output, which are sufficient to power most professional cameras. The built-in 4-LED power gauge lets you see power remaining. The two-bay charger can simultaneously charge two batteries, and it incorporates a 4-pin XLR power out that can be used to provide camera power. The charger's built-in capacity management system ensures that it will charge your batteries in the shortest amount of time possible. An integrated carry handle makes the charger easy to transport with or without batteries attached. The 3-position power switch lets you select form charge mode, DC output mode, and off. The portable V-Mount Dual Battery Charger with XLR Output from IndiPRO Tools features a 4-pin XLR output for powering accessories. When in charging mode, an integrated capacity-management system provides the fastest charge possible. This lightweight charger is designed with a built-in carry handle, battery release levers, and a charge/DC-out/off switch. Box Dimensions (LxWxH) 10.9 x 9.0 x 5.3"
2 x Micro-Series 98Wh Li-Ion V-Mount Batteries with Dual V-Mount Battery Charger Kit is rated 5.0 out of 5 by 2. Rated 5 out of 5 by Bruce from Good batteries for LED lighting I purchased the batteries to power my Aputure 120D lights. A higher than normal 11 amp rating is required and these batteries delivered full power until the battery was exhausted, 45 min. Excellent performance. Rated 5 out of 5 by JP from USB is a lifesaver/Monitor Power Used the integrated USB to charge my phone when u didnt have any other charger it worked perfectly and the batteries powered my monitor perfectly! Looking into these batteries for the new BMPCC 4K. About how long can one battery last in continuous use? Will this work on the RED Scarlet MX?